Grey, low hanging cloud and drizzling rain greeted us early this Sunday morning. Our customers could have been forgiven for taking one peek out the window and rolling over in their warm beds. But instead, they joined us in the dismal weather to venture 30km offshore in search of adventure. Right on the edge of visibility a dark shape materialized, rapidly getting closer and more impressive. A large female Mako shark, built like a fleshy bullet, had come to investigate. She swam constant circles around us, fast and confident, coming close to inspect these bubble blowing creatures. Most Makos are fleeting visitors and rarely hang around for more than a few minutes. This large lady stayed with us for over 30 minutes, giving us the opportunity to take in the true speed and power of these incredible sharks, and leaving us with a feeling of profound awe. We took this home with us, along with some great shots, and felt we had been more than amply rewarded for be the adverse weather. As our larger than life skipper loves to remind us – you’ve got to be in it to win it! Nice one team! 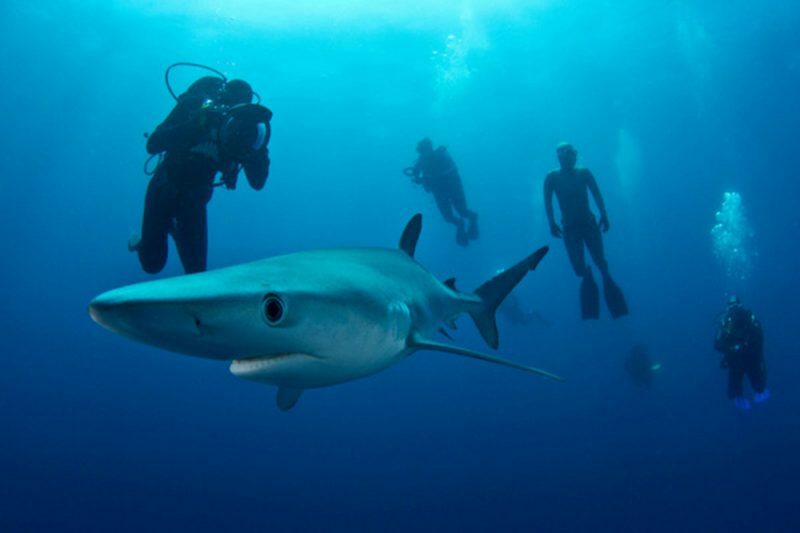 If you would like to join us for our next blue and mako dive in the deep, contact us here.